Of all the recipes my Mom taught me to make when I was young, my favorite is Chicken and Dumplings. 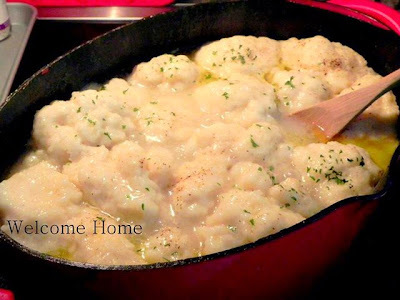 It is the ultimate comfort food with the tender, moist chicken and fluffly biscuit-like drop dumplings that melt in your mouth. Of course my... Mom make her own handmade dough for the dumplings and I take a short cut and use Bisquick to get the same exact flavors in less time. In Dutch oven or large wide pot, over medium heat, add chicken and cover with water. Heat to boiling and then reduce heat and cook for about 90 minutes until chicken is fork tender. Remove chicken from broth and set aside to cool. Mix 1/4 cup milk and 1 tablespoon of cornstarch, to broth bring to slow boil. Meanwhile remove skin and bones from chicken and shred or cut into bite sized pieces. Add to soup mixture. Stir to combine and cover. Mix the 2 cups of Bisquick and 2/3 cups of milk together to form a soft dough. Then drop spoonfuls of dough into the broth and bring it down to a simmer. Reduce heat to simmer and cook uncovered for 10 minutes and then cover and steam for 10-15 minutes or until dumplings are done in the middle. Season with salt and lots of pepper and sprinkle with a little parsley. Cut in the shortening. You can use a pastry blender, however, I find it easier to just use my hands to get it mixed in really well. Store in an airtight container. Use the same as you would use Bisquick in a recipe. If you use cold butter in the recipe, you will need to keep this in the refrigerator. If you use shortening you can store it in your pantry.